If you are getting sick of than unsightly tree stump, you have come to the right place. Richmond Hill Tree Service provides tree stump removal throughout the York region. We service residential and commercial properties in Richmond Hill, King, Markham, East Gwillimbury, Georgina, Newmarket, Aurora, Scarborough, North York and Vaughan. Our professional tree service team can remove any sized stump as well as stubborn surface roots around your property. No project is too big or too small for us. Our certified arborist and highly skilled crew have extensive experience in tree stump removal, stump grinding and all aspects of tree care. When you hire our tree service in Richmond Hill, you can be confident that you are hiring qualified professionals for the job. You can count on our friendly and courteous team members to keep the work site clean during and after tree removal. We take pride in our work and it shows from our ability to complete the job without damaging surrounding trees and landscaping around the area. Removing a stump can be a pretty time-consuming process that requires specialized power tools, technical knowledge and yes, a whole lot of brute force. Our team has the experience, ability and proper equipment for a safe and effective stump solution. No two stumps are the same, and depending on the location and condition of the stump, our removal team may employ a different technique. 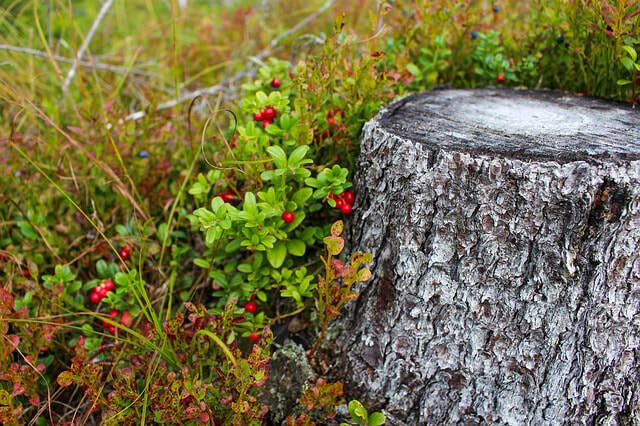 If your tree stump is in a flat or fairly level, open area, tree stump removal can be straightforward. Using our up to date equipment and a lot of elbow grease, we will remove the entire stump including the roots. If your tree stump is located in a hill or inclined lot that may be prone to erosion, we will suggest grinding the stump while leaving the roots intact. Leaving the roots will help hold the soil together, preventing erosion while removing the unsightly stump. However, this may not be possible for some species of trees. Some roots can cause some collateral damage to surrounding structures such as sidewalks, roads, walkways and building foundations. Large roots may continue to grow and produce suckers or new shoots that can grow into another tree. If this is the case then complete removal may be necessary. Using our power grinder, we will slowly grind the stump away down to about 12 to 14 inches into the ground. There is a significant amount of wood in the stump more than people realize and stump grinding can produce a whole lot of mulch. This can be mixed with topsoil and back filled to cover the stump hole. We can also have it removed and prepare your land for new topsoil and landscaping. Richmond Hill Tree Service specializes in safe and effective stump removal and stump grinding in the York region. You can count on our team to provide the best solution for your stump problem so you can go back to enjoying the beauty of your property. In addition to providing tree stump removals, we also offer a whole suite of tree care services including pruning, trimming and landscaping. We’re happy to provide a FREE quote for all your tree needs, simply give us a call at 647-490-9067 or send us a message on this page.